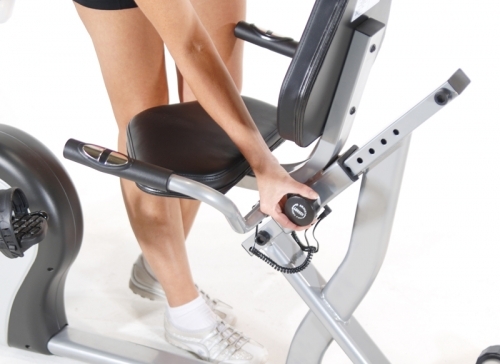 Stamina® Fusion bikes represent the biggest innovation in stationary bikes since the introduction of the recumbent. This new category of exercise bikes combines the traditional biking feel of the upright with the comfort of the recumbent for a bike that you'll be able to use for longer, more effective, more ergonomically correct workouts. The Stamina Magnetic Fusion 7100 Exercise Bike offers a magnetic free-wheel resistance system that offers a smooth, quiet workout. 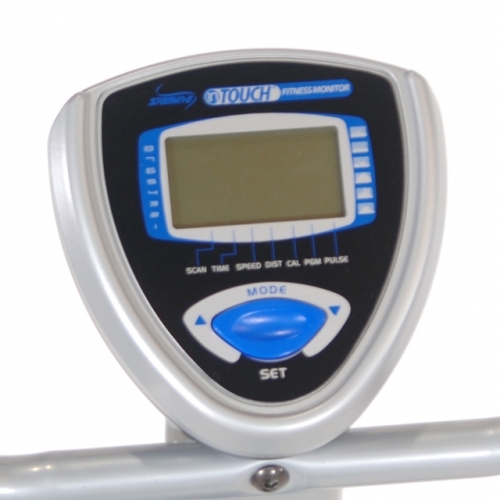 Fingertip pulse sensors built into handrails to monitor heart rate Wheels for easy transport InTouch one-button console easily adjusts to different levels of workout intensity without interrupting your workout Large, easy-to-read console displays workout time, speed, distance, and calories. Comfortable oversized adjustable seat with 45-degree leg angle to reduce hip and leg stress Leveling stabilizer caps provide a smooth and comfortable workout Sturdy steel frame. With its smooth, quiet magnetic resistance, upgraded electronic tracking monitor, 6 preset programs and one manual program, the Stamina® Magnetic Fusion 7100 exercise bike will be the piece of equipment that makes you look forward to your workout. The walk-thru design gives you an easy, safe way to get on and off the bike, and the padded, oversized seat with seatback and oversized pedals keep you comfortable and supported. The seat slides at a 45 degree angle so your feet, legs, and hips are aligned to give you power on the downstroke and the upstroke for the best cycling workout possible. The Stamina Magnetic Fusion 7100 Exercise Bike exercise bike combines the traditional biking feel of the upright with the comfort of the recumbent for a bike that you'll want to use longer than an ordinary bike. 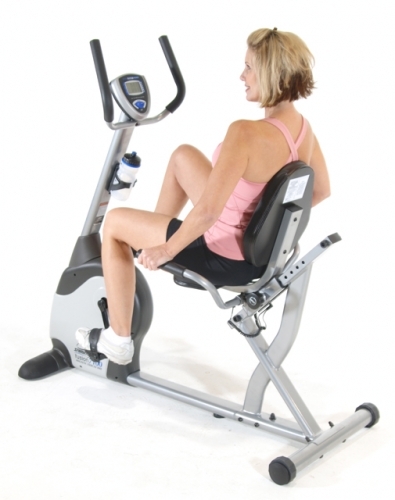 Order your Stamina Magnetic Fusion 7100 Exercise Bike from FitnessZone.com today! Chat with one of our friendly agents at FitnessZone and learn more about the Stamina Magnetic Fusion 7100 Exercise Bike. 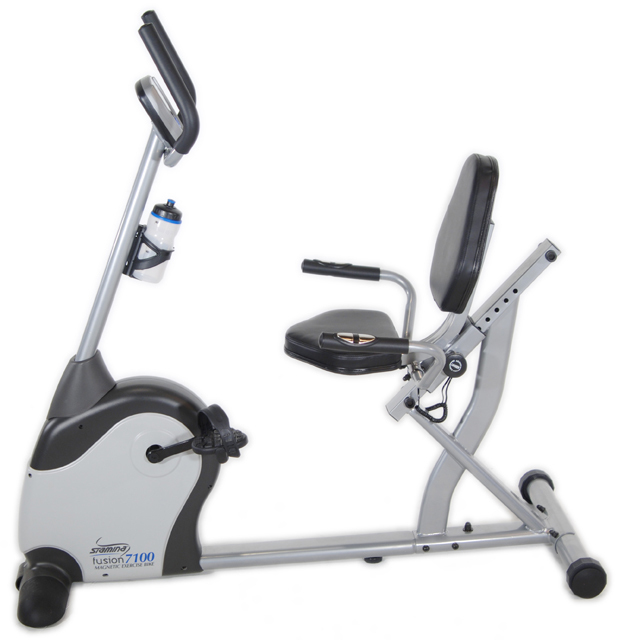 Order your Stamina Magnetic Fusion 7100 Exercise Bike from FitnessZone.com today!